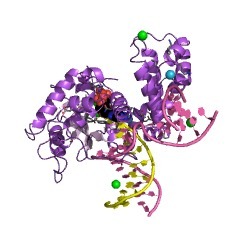 Polbase - Reference: Structures of DNA polymerase beta with active-site mismatches suggest a transient abasic site intermediate during misincorporation. Structures of DNA polymerase beta with active-site mismatches suggest a transient abasic site intermediate during misincorporation. We report the crystallographic structures of DNA polymerase beta with dG-dAMPCPP and dC-dAMPCPP mismatches in the active site. These premutagenic structures were obtained with a nonhydrolyzable incoming nucleotide analog, dAMPCPP, and Mn(2+). Substituting Mn(2+) for Mg(2+) significantly decreases the fidelity of DNA synthesis. The structures reveal that the enzyme is in a closed conformation like that observed with a matched Watson-Crick base pair. The incorrect dAMPCPP binds in a conformation identical to that observed with the correct nucleotide. 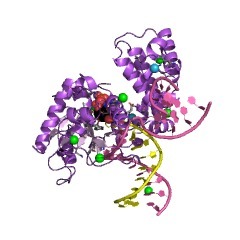 To accommodate the incorrect nucleotide and closed protein conformation, the template strand in the vicinity of the active site has shifted upstream over 3 A, removing the coding base from the active site and generating an abasic templating pocket. The primer terminus rotates as its complementary template base is repositioned. This rotation moves O3' of the primer terminus away from the alpha-phosphate of the incoming nucleotide, thereby deterring misincorporation.